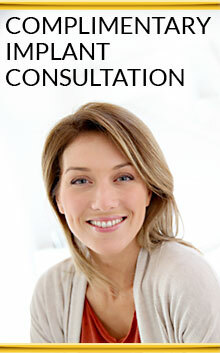 Dr. Meserkhani will review your treatment options, and discuss the benefits and advantages of dental implants. A dental implant is comprised of three components: a titanium post that is anchored into the jawbone to replace the missing tooth root, a restoration that replaces the missing crown of the tooth, and an abutment that connects these two. Dental implants can be used to replace a single missing tooth, or to provide support for bridges or dentures when several or all teeth are missing. Most dental professionals agree that dental implants are the modern solution for replacing missing teeth. They are preferable to dental bridges when replacing a single missing tooth and provide support for dentures when needed for replacing all natural teeth. Implants are the strongest and longest-lasting replacement for missing teeth. 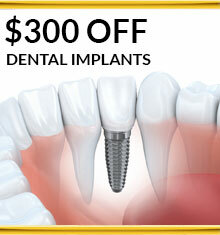 Implants deter or prevent bone loss that occurs when teeth are lost. They preserve facial structures collapsing due to bone loss. Implants let you talk, chew and exert pressure just like with natural teeth. Implants look, feel and act like natural teeth. People usually don’t notice any difference. Implants don’t require alteration to the structure of adjacent teeth, as with traditional dental bridges. By filling the gap, they keep adjacent teeth stable and prevent bacteria from accumulating that would lead to gum disease. Advancements in dental technology have given Dr. Meserkhani the ability to precisely plan your dental implant surgery in advance. He can locate viable bone, create surgical guides which determine the exact angle your implant should be placed at. This comprehensive pre-planning makes the actual implant surgery a minimally invasive procedure with little to no post-operative discomfort. Learn more about our Dental Implant Services. Historically, the only answer to multiple, or all, missing teeth was wearing dentures. Although dentures can be more affordable, and may still be the solution of choice for people who are afraid of, or ineligible for, surgery, they are no longer the only option. There are now many alternatives for replacing missing teeth, and our doctors are very experienced, and well equipped to offer additional solutions. Learn more about Options for Missing Teeth. 1# When a tooth is lost or extracted, the bone beneath the missing tooth begins to atrophy. In the first year after a tooth is lost, 25% of the bone volume is reabsorbed back into the body. This process continues until potentially only the hard basal bone of the jawbone is left.Dentures accelerate this bone loss process by aggravating the boney ridges where teeth sit, wearing them down. This loss of bone in the jawbone eventually causes collapse of the facial muscles around the jaw. The height between the tip of the nose and the chin progressively decreases, causing the lower third of the face to collapse. This collapse inwards into the face which also creates excessive wrinkles around the mouth, drooping jowls, sagging skin and thinning lips. The chin becomes more pointed. A person’s appearance can be aged many years as a result. #2 Dentures provide only 10% of natural chewing power. Many denture wearers are forced to avoid foods such as crunchy fruits, vegetables and nuts, and can’t chew meats. Avoiding the foods you need to maintain a balanced diet can lead to malnutrition. #3 Due to the continuous loss of bone, dentures easily lose their fit. This can cause denture sores and painful chewing. Denture wearers or people who have had missing teeth for a long time suffer from bone loss in the ridges that normally support the tooth roots. In the past people with insufficient bone have been refused dental implant treatment. Now, with advanced bone grafting technology, plus the ability to locate available bone through 3D imaging technology, the majority of people can receive implants regardless of the volume of bone. People with certain health conditions such as diabetes or habits such as smoking were previously not considered candidates for implants because of the potential risk of failure of the implant or of infection. With recent developments in technology these people can now be safely treated.